I cooked the most delicious lunch on Sunday. I know this for a fact because my mother told me about 17 times while we were eating it having had a couple too many glasses of Macon-Villages. Still, I’m never going to complain about being over-praised for something so thank you Mum and you’re very welcome. 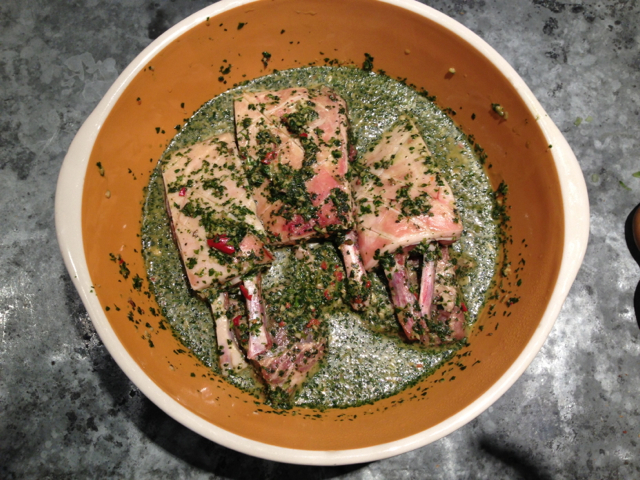 Separate the rack into portions of two or three cutlets and place in a non-metallic bowl. Blitz together all the remaining ingredients in a blender or a food processor, pour them over the lamb and make sure it is well covered in the marinade. Cover and keep in the fridge overnight or for at least 8 hours. Preheat the oven to 200c. Heat up a heavy cast iron pan, preferably a griddle pan. Remove the meat from the marinade, shaking off the excess. Sear well on all sides, about 5 minutes in total. 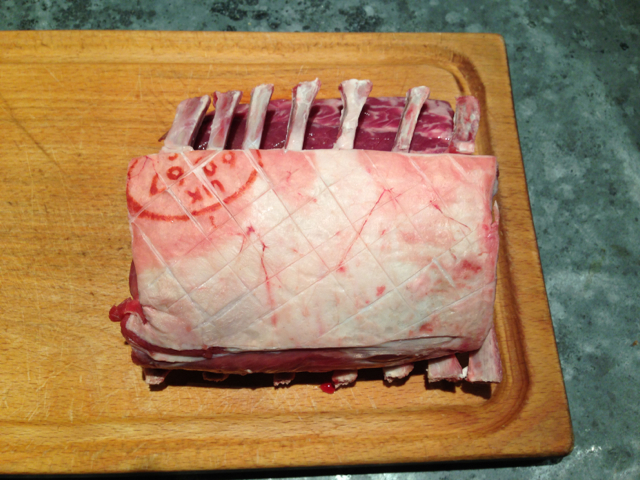 Transfer to a baking tray and cook in the oven for about 15 mins, depending on the size of the racks and how well cooked you want them. Meanwhile, heat the marinade in a small pan and simmer for 5 minutes. Both the cutlets and sauce can be served hot or at room temperature. When I had stuck my finger in the marinade the night before I had been a little bit nervous that the flavours weren’t entirely balanced. I now feel like a complete idiot for ever doubting the recipe. It was fantastic and we really did have the most stonking lunch. We had it with Ottolenghi’s marinated aubergines (from the same book – I forgot to make the tahini sauce but I don’t think it needed it), baby roast potatoes, spinach and pine nuts and yoghurt on the side (natural yoghurt with grated cucumber, a tiny amount of crushed garlic and ground cumin). I had thought this would go brilliantly with the Barbera d’Asti but with the multitude of flavours in this dish from all the fresh herbs it needed a white rather than a red wine. 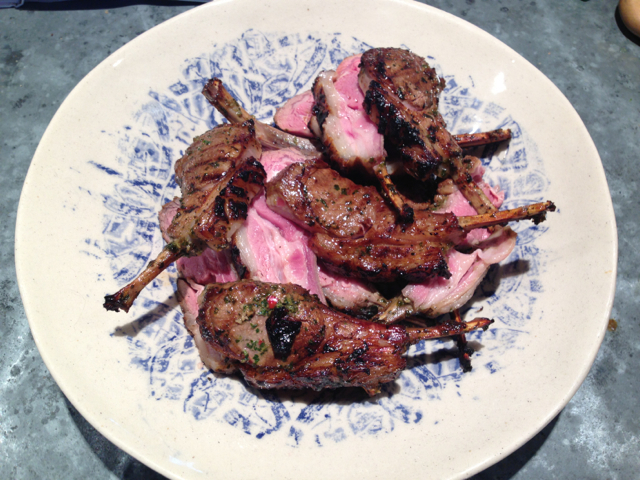 It was a much better match with the Roero Arneis which had the body to stand up to the lamb but the delicacy of flavour not to overpower the herbs and spices. I love it when a lunch comes together. Hunting for haggis in south London is more difficult than I had previously anticipated. I had to go all the way to Waitrose in Clapham as none of the Brixton supermarkets (shockingly) stocked them. Despite spending 4 years of my life living in Scotland I certainly don’t pretend to be any sort of haggis expert. Of course I’ve eaten it but I’ve never cooked it and so never had to buy one before. So on this particular occasion I had to consult my Scottish friend, and to all intensive purposes haggis expert, Katie. 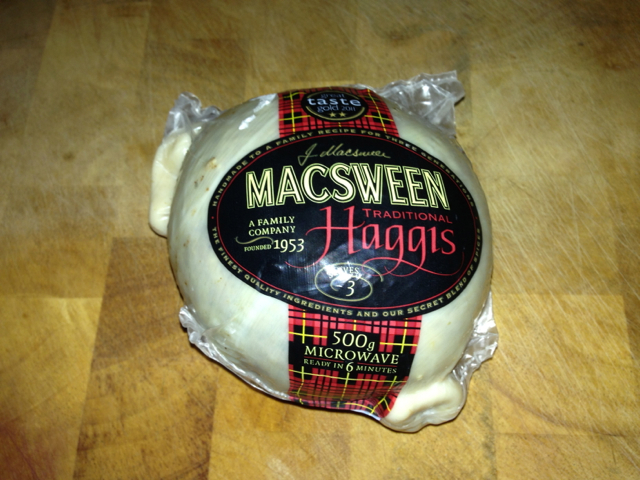 Apparently there’s only one acceptable brand of haggis to buy, which is MacSween’s, so that is what I bought. The cooking instructions on the back suggested two methods of cooking, one which was considerably less hassle than the other. Second question to Scottish Katie: “Is it bad form to cook my haggis in the microwave?” Apparently not. All the better. This therefore turned into possibly the easiest dish I have ever cooked. Please don’t get the wrong idea, I would never NEVER normally cook anything in the microwave, but if Mr and Mrs MacSween and Scottish Katie say that’s the way to go, I am in no position to argue. If the best thing about this dish is how easy it was to cook, the second best was that I tricked Mr F into eating swede. The phrase “haggis, neeps and tatties” was bandied about the house all day without him ever bothering to ask what neeps were. Anyone who’s known my husband for any considerable length of time will have heard the story about when, aged 9, he threw a swede across the kitchen in outrage and disgust after his poor mother had tried to cook it for him for dinner. Needless to say no one, to my knowledge, has ever attempted to give it to him again… until now! Peel and chop the potatoes and swede into large cubes. Boil them together in the same pan (the swede will need about 5 mins longer so put this in first). While the potatoes and swede are cooking prepare the haggis as per the packet instructions. When it is all nearly ready make your sauce; reduce 3 tablespoons of whisky in a small saucepan over a medium heat until it has almost (but not quite) all evaporated, then add half a small carton of double cream. Bring back to the boil and then remove from the heat. Drain your neeps and tatties and mash with a generous slice of butter (and more cream if you like). 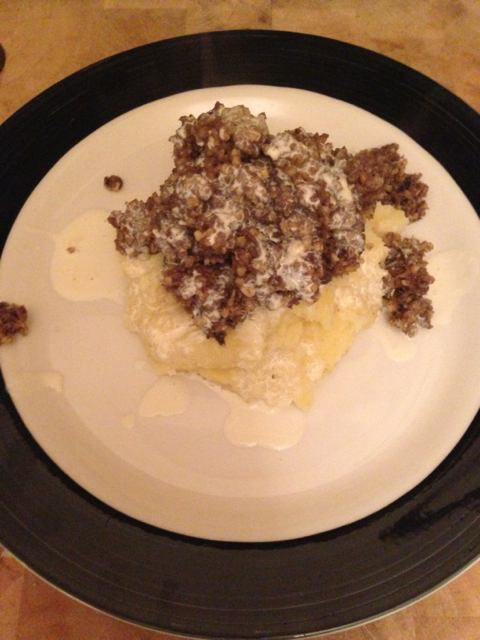 Serve by piling your haggis on top of the neeps and tatties and drizzling with a generous couple of spoonfuls of sauce. How easy is that?! Now since Friday night is Burn’s Night I’m sure this is what you’ll all be eating. Of course you could stick to the hard stuff and just have Whisky but over an entire evening that would be a bit much for me. If it’s wine you’re having it definitely needs to be red; something with big, fruity flavours and a bit of spice. An Australian Shiraz would be nice, or if it’s Old World you’re after than anything from the Rhone Valley. Whatever you’re drinking make sure you have lots of it and revel in the knowledge that you’re enjoying one of the easiest and cheapest meals you’ll probably eat all year. Thank you Robbie Burns!! I have this thing about cooking. If I have someone coming for supper I will have been thinking about what I’m going to cook pretty much since the moment I invited them. That isn’t to say that it’s necessarily something fancy, more that it’s something that fits with the person I’m cooking for and it gives me an excuse to try certain recipes that I haven’t been able to justify for just myself. Some people warrant ‘safe recipes’ – ones you’ve tried and tested and know are crowd pleasers but don’t take too much thinking about. This tends to be an evening where all element of risk is removed from the equation; generally speaking people you know less well. This was not one of those evenings. The second thing about me and cooking is that once I’ve decided what I’m cooking, that’s it. There are no last minute changes and no backing out. Usually I will have bought food at least the day before. As I said… not one of those evenings. I really really thought that pork mince is the kind of thing you can buy anywhere but on this particular day it felt as if it was sold out of every single mini supermarket in London. I’ve never had to ask someone I’ve invited for dinner to bring their own food before, but this is what happened. Charlotte, I’m very very sorry and I promise, the next time you come back from Africa I will not send you to THREE SUPERMARKETS looking for pork mince just because I’m too stubborn and unimaginative to think of something else to cook. Confession out the way (I really did feel jolly guilty about that); let’s focus on the fact that I had been planning to cook these for supper since at least the weekend before which shows immense effort and thoughtfulness on my part (clutching at straws here??) – and that they were really rather good. Chop the shallots or spring onions finely, then chop the chillies even finer, first removing the seeds if you don’t like things too hot. Scrub the roots of the coriander and chop them and the leaves finely, discarding the stems. Roll the lime leaves up and shred them finely, then chop them: if you are using lemon grass, remove the coarse outer leaves and discard them, then chop the tender inside leaves very thinly. Chop the bacon or pancetta and add it, with the seasoning above, to the minced pork. Mix in a good pinch of salt, then cover with clingfilm and leave to rest in the fridge for half an hour. Shape the seasoned pork into small balls and flatten them slightly. To cook you will need to warm a little oil in a heavy frying pan, then lay the meatballs in – without crowding them – and let them colour on both sides before turning the heat down a bit and letting them cook all the way through. They should be done after 4 or 5 minutes – the centre should be juicy but not especially pink. 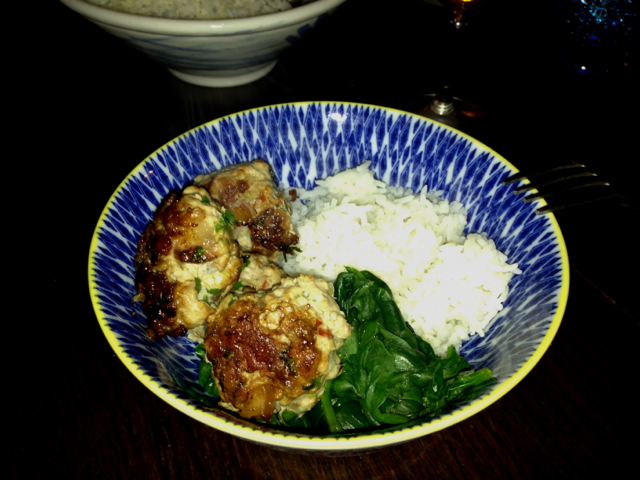 We had this with basmati rice and spinach and it was delicious. A really clean dish that was straightforward to cook but something a bit different. It was a pretty good match with the La Grille Chenin Blanc (see Tuesday’s post); texturally speaking it was perfect and the chilli in the meatballs was complemented really well by the off dry edge to the wine. So not too much of a disaster in the end despite the somewhat hectic beginning. What jolly important meatballs these are to warrant so much fuss. One of the all time fantastic cooks in my life growing up was our great family friend Orlando Gough. Orlando has just had a book of his recipes published – Orlando Gough Recipe Journal – and this means, thrillingly, that his recipes are now available to all. I was very flattered to get a mention in the book (look out for me on page 75!!) 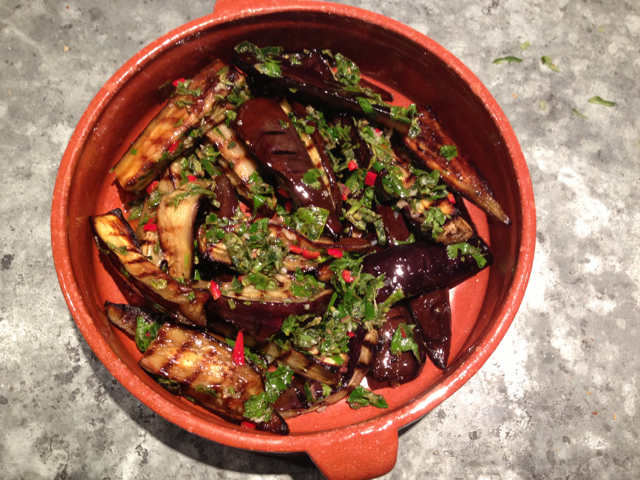 and so it only seems right that my first recipe post of 2013 was one of his. His Chicken Polo particularly jumped out at me when I first flicked through; I suspect because it’s an Iranian dish and my husband’s maternal family are all from Iran, which goes a long way towards explaining Mr F’s extreme love of yoghurt. This dish was absolutely delicious, gently aromatic and nowhere near as sweet as I expected considering the apricots. I have never cooked with cardamom before (except for accidentally eating a whole pod nestled in the pilau rice of a takeaway curry) which is a beautiful, subtle spice. This would be a great dinner party dish as once the chicken and rice are on there’s nothing left to do. Using a large frying pan, brown the chicken thighs in a few tablespoons of olive oil. Add the chopped onion and fry gentry for 15 mins. While the onion is frying, boil the rice for 10 mins in 600ml water (rule of thumb: twice the weight of the rice). Rinse it very thoroughly under the cold tap to get rid of the starch. Melt the butter in a thick-bottomed saucepan, add the rice and a little salt, and stir. Put on the lid of the saucepan, wrapped in a tea towel, and cook over a very low heat for 45 mins. A crunchy light brown crust, known in Iran as dig, should form on the bottom of the rice. Once you’ve got the rice on, add the apricots, cardamom seeds, cinnamon, raisins and chicken stock to the chicken and onions. Season. Empty the mixture into a saucepan, cover, and simmer over a low heat for 45 mins, making sure it doesn’t dry out. You should be left with a few tablespoons of luscious sauce. 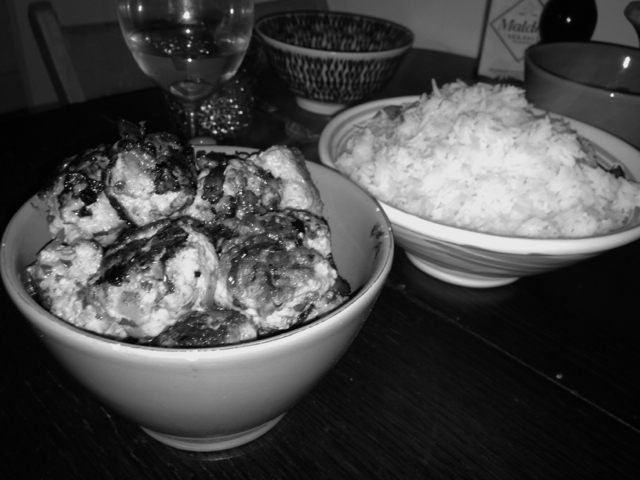 Empty the rice onto a dish, break up the crust and mix in the chicken stew. This dish went beautifully with the McManis Family Vineyards Viognier from Majestic Wine. It needed something with enough body to stand up to the creamy sauce created by the stock and something to balance the slight sweetness of the apricots. This wine was shockingly good even for it’s £8.79 price point. Viogniers can sometimes lack balance and come in an array of different styles but they are almost always great food wines. This particular one has a nose of fresh apricot and spice, it is gently floral without being overpowering. The body is dry and pretty full, it has a great texture (not too oily) and displays flavours of apricot, stone fruit and spice. With such a fantastic length it tastes a lot more expensive than it is. So there you have it – hopefully something a little bit different for you to try in both the Chicken Polo and the Viognier. And a big thank you to Orlando for a wonderful recipe. There is something rather liberating about cooking for yourself. It’s a bit like going to the cinema or out to lunch on your own. It means no one is there to see the mistakes you make; you have the confidence to experiment more knowing that the only feedback you’ll get at the end of the night is your own. I have been known to stay in on a Saturday night and cook a three course meal for myself, drinking a bottle of wine – and I rather love it. Tonight is one of those nights (although it’s a Friday). Mr F is out and I have to work tomorrow. Having survived for the last two days off cereal, beetroot soup (actually delicious) and reheated pizza (no jokes) I am craving a proper dinner. The starter is a triumph, the main a disaster and the pud is in the oven so I’ll let you know later. Before I tell you about the starter I must tell you about the wine I’m drinking. It is called Mitius La di Motte and was given to me as a present by a totally charming wine producer in Italy earlier this year. I think it is produced on the Botter estate in the Veneto region of Italy (just in case you’re interested) but I doubt very much if it is available to buy in the UK. Almost opaque ruby red, the nose is pretty closed not giving anything away. This makes the palate all the more surprising; chalky tannins but lush, sweet, port-like red fruit to go with it. Although a bit clumsily put together it has a rusticity and softness which makes it totally delicious. Blanch the tomato in boiling water for 1minute; then drain immediately and soak in cold water for a further minute. Peel the skin off the tomato and chop in half. Remove the seeds and core. Blend thoroughly in a food processor with the garlic until it is a smooth paste. Fry a couple of rashers of pancetta in a frying pan until crispy; if you are using jamón ibérico it is fine as it is. Toast a slice of sourdough and allow to cool. You can now begin to assemble everything – drizzle a little olive oil on top of the toast, then spread a spoonful of tomato paste and finally lay the pancetta (or ham) on top. 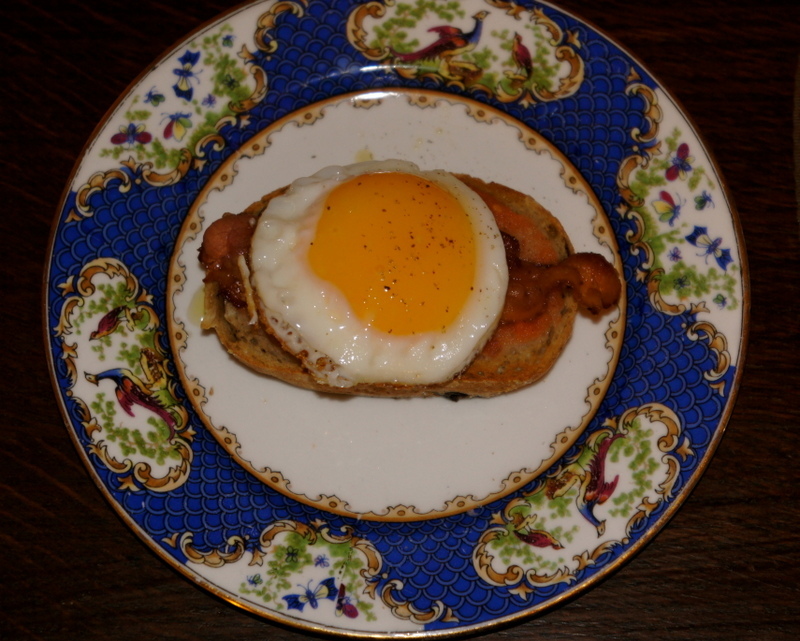 Fry a quails egg in the frying pan (be careful not to break the yolk). And this goes on top of everything else. Season with a little salt and pepper. It is very decadent but very very good. As I said my main course was disappointing (my Béarnaise sauce curdled – I don’t want to talk about it). Having just had my pud it was good but is not going to set the world on fire. Ready rolled puff pastry cut into individual circles and topped with thin slices of Cox’s apples and sprinkled with a little soft brown sugar and cinnamon. Then baked in the oven at 180 for 25 mins. I was going for individual apple tarts and they are fine, if not a little dry, definitely need tweaking. Now if you’ll excuse me I’m going to finish my bottle of wine on the soft in front of a movie. Hurray for Friday nights in! !